 Dade Christian Competition Cheerleading is to support our athletic teams on and off the field, to represent and compete for our school in local and national venues, to perform at special events at our school and in the community, and to exemplify a good Christian testimony through cheerleading. The Elementary Competition Cheerleading team consists of 1st-5th grade girls who have a passion for cheerleading. The team is aimed at teaching young girls the fundamentals of cheerleading while fostering a lifelong love for the sport. These girls learn the importance of discipline and teamwork all while having a terrific time. Most importantly, the girls begin to understand how to utilize their talents to praise and worship God. Cheerleading is aimed at providing the school with spirit and school pride through pep rallies, football games, and competitions. Centered on Christian values, the team strives to bring glory to God through the routines they perform and the involvement they have in the school. A team consists of 10 girls from 8th-12th grade. The cheerleaders on this team display a certain skill level, maintain good grades, have a positive attitude, and are full of spirit! Cheerleading will be dependent upon our students interests.